Samsung BD-C6500 review | What Hi-Fi? In our experience, Samsung has always served up affordable Blu-ray players that are easy to live with. However, when comparative tests come calling, they rarely take the plaudits. 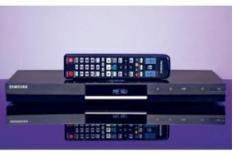 But now that Samsung's BD-C6900 3D Blu-ray player is making waves, perhaps the company's dedicated decks can follow suit. A quick blast of Harry Potter and the Chamber of Secrets impresses with a decent level of insight and edge definition. The Hogwarts uniforms show a fair amount of detail and give a good impression of texture, while colours are nicely judged. But the Samsung image is hindered by traces of noise. This prevents the deck showing the same level of depth and clarity as the best out there at this price level. The 'C6500 could also handle movement with greater confidence: some of the coastline panning shots during It's Complicated show flicker and judder. Other players are more accomplished when it comes to sound quality, too. The Samsung has a tendency to sound bright and hard. When Harry Potter and Ron Weasley commandeer a flying Ford Anglia and chase after the Hogwart's train, the lively effects sound aggressive and unruly. Spin a CD and these traits are still present, while also highlighting the machine's lack of rhythm. Florence and the Machine's You've Got The Love shows insecurities in the Samsung's timing and there's a subsequent lack of connection with the listener. While you can take picture and sound performance to task, there's nothing to grumble about when you run through the 'C6500's specification. Considering the price tag, it's amazing that Samsung has been able to cram in easy-to-use wireless functionality, a set of multichannel analogue outputs and 1GB of internal memory. That's before you test out the Internet@TV feature, which gives you the ability to stream online content from the likes of LoveFilm and Muzu.tv. It's easy to use and the player is constantly updated as and when new services are released. If star ratings were based purely on functionality straight out the box, the 'C6500 would sport a five-star review. Unfortunately, this isn't the case and the truth of the matter is you can get superior picture and sound performance from rival machines at the same price.